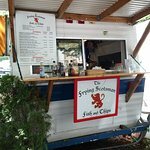 Description: This is a foodcart, so it might not qualify for your purposes, but this was the best Fish and Chips I have ever had. And I've had fish and chips is over 12 counties. I was so impressed, I had to try to get him listed here. This was a little difficult to find, but well worth the trip. 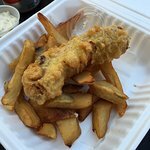 As a big fish and chips fan, this is one of the best I've had. Also discovered a great drink IRN BRU, from GB. 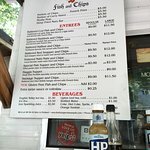 Haven't been able to have fish and chips for years due to celiac disease. 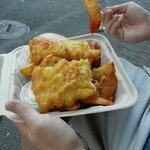 The gluten free batter was light and delicious and the chips were crispy on the outside and soft inside. So good after a long day of travel! Ive eaten alot of fish and chips all around the states and i could say these were average. The fry oil smelled and tasted like it need to be changed. Cod was fine, service was all you could expect from a food cart. The actual price was higher than on their web site. this was truly the worst I've ever eaten. Flavorless chips- great size though but ice has more taste. The fish was large but how can anyone louse up haddock so badly? I really felt that the whole operation was very poorly set up. First, no seating, anywhere. You have to walk a block to a park that's infested with drunks sleeping in the shadowed areas or dodge the people talking to themselves. Poor condiments- ketchup tasted awful. Only malt vinegar. No lemon, just squeeze juice from a bottle- that's the way to impress customers! I've had better from a city-run concession stand at one of vancouver's beaches! 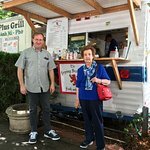 I tried this food-cart on a mid-day Saturday. 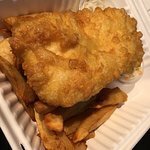 He had already ran out of mostly everything; I was able to get the cod and chips. Good fish, it was seasoned well and had a nice texture. The tartar sauce was good too thats important for me, i was pleased! Fries, eh....The only thing about fish and chip and thats everybody's fish and chips was "The Grease Factor" ugh... 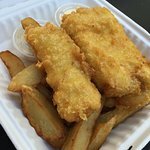 I was we could think of a way to eliminate the awful greasiness of Fish and Chips! 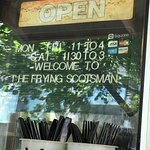 Been to The Frying Scotsman? Share your experiences!